ME-Models has stopped all online activities, their website is down, no-one is answering emails. 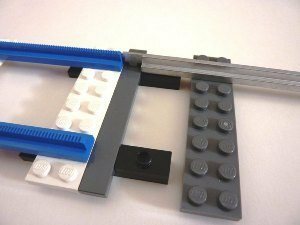 Many fans which investeded money on the Kickstarter project never got any products from ME-Models. I am not selling any ME-Models products by myself. After 5 weeks my first order at ME-Models has arrived from the USA. 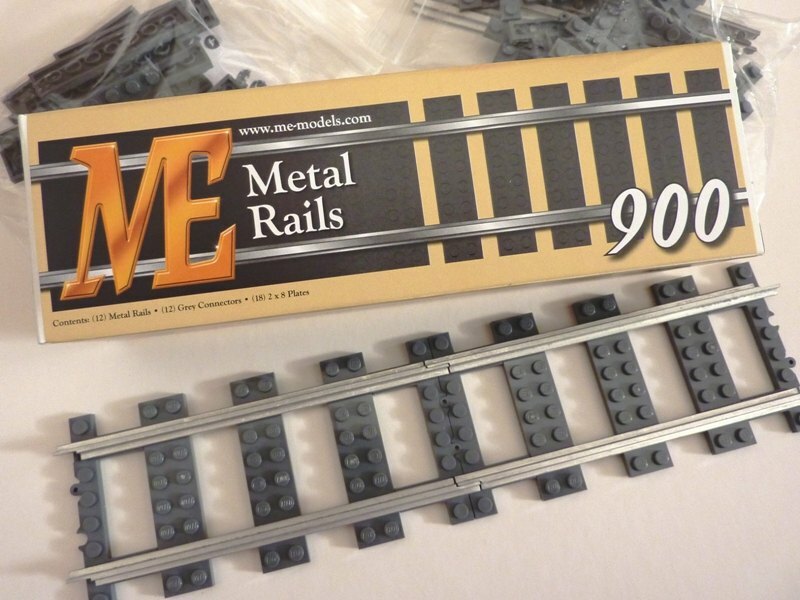 I ordered five boxes "Metal Rails - Gray (Box) [ME900G]" each 19,99 US$. The grand total including shipping was just below 100 Euro which was paid easily by PayPal. Each box ME900G contains 12 metal rails (16 studs long), 12 darkgrey rail connections and 18 real 2x8 LEGO plates. 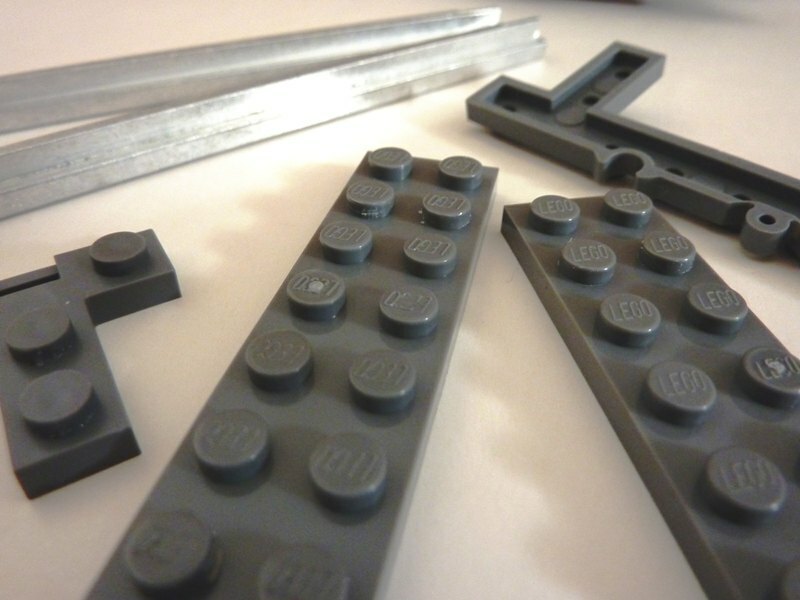 Building instructions are not needed to put the pieces together. To guarantee a better power supply you can add aluminium foil tape underneath each rail connection. This foil tape comes within each box. I didn't use it during my testing and it was not necessary. The power supply was Ok all over the test loop. 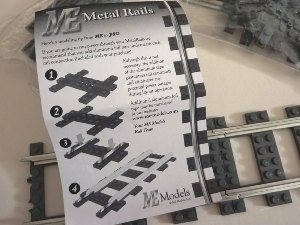 The pieces: rails, rail connections and 2x8 plates. 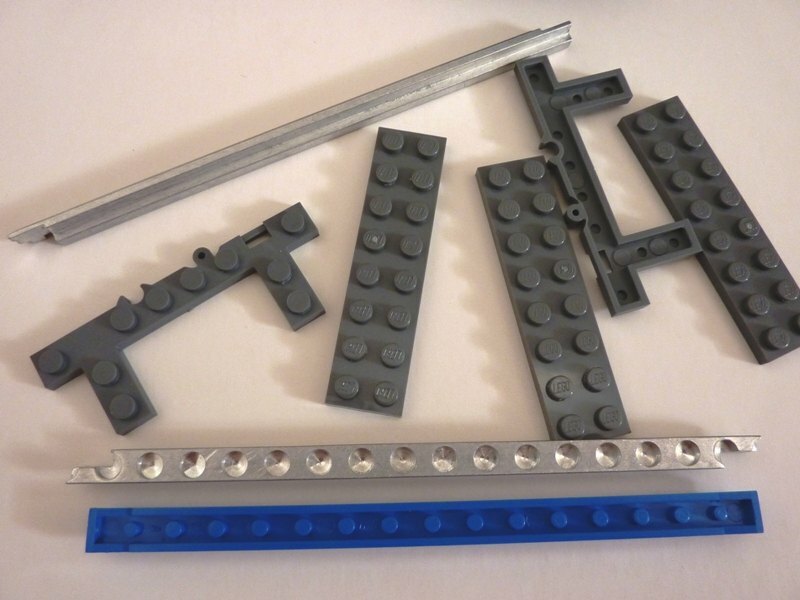 Comparison of a ME Metal Rail and an old blue LEGO rail (seen from below). 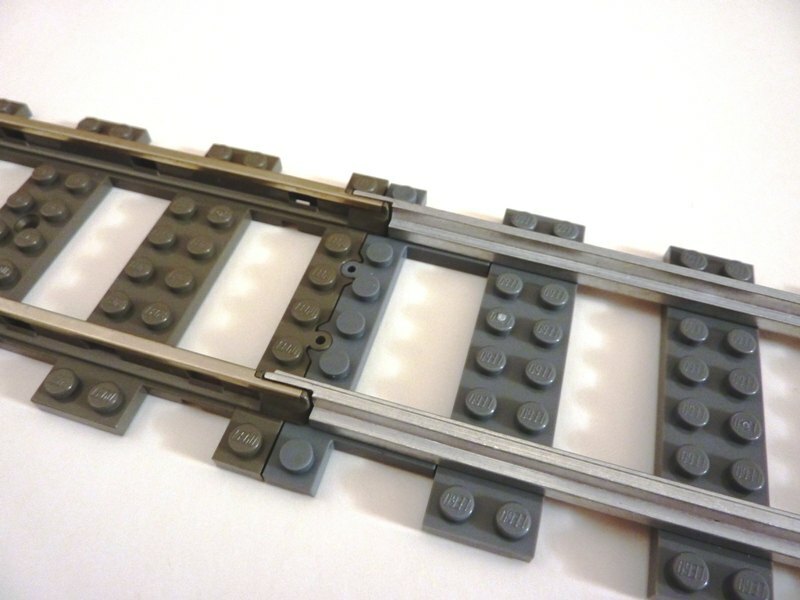 Due to the new rail connection from ME both standard 9V LEGO track and ME Metal Rails are perfectly connected to each other. Using old 4,5V LEGO rails you need some offset tricks, but LEGO trains can run on them without problems. 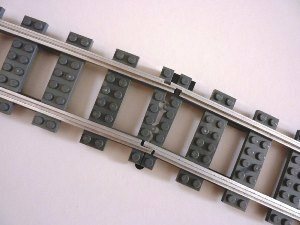 The aluminium rails from ME are fixed very tight on the sleepers. 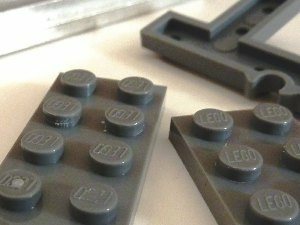 While taking them apart you'll need some power and unfortunatelly some marks will remain on the studes on your LEGO plates. 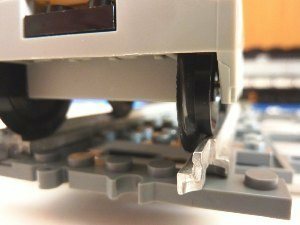 This close-up shows a 9V train wheelset on ME Metal Rails. Maybe not ideal as on standard 9V track but I couldn't see any difference while watching the trains running. The shape of the ME Metal Rails is identical to the shape of old blue/grey LEGO rails. 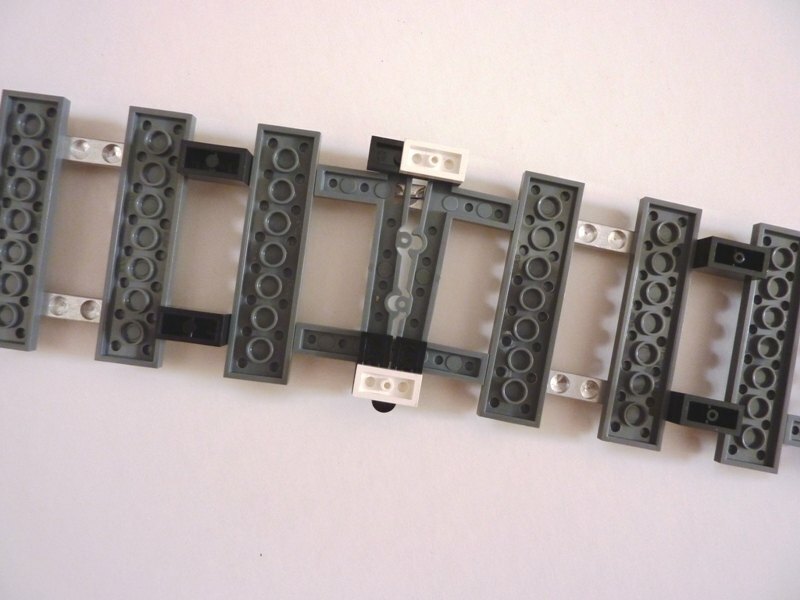 Long Curves can be build using Metal Rails by ME without a problem.